Last monsoon, I brought home a small grapevine, which I intended to plant, as usual, in one of the many pots, I have on my roof. The plant flourished well all throughout the monsoon, and then the winters came. The grapevine stopped growing further and halted till where it grew during the pre-winter period. Eventually, it started loosing its leaves, much, a character (Timothy) in the movie, I really liked -- "The Odd life of Timothy Green". The leaves went pale, and all fell, rendering the vine leafless and bare. Though, at first, it appeared to me as if my grapevine had died, and since it was for the first time, I planted a grapevine, I wasn't used to such falling of leaves. Throughout the winters, I used to scratch the bare stem of the vine, to checkout if it's still green from inside and alive, and, it was. When the winters passed, the tiny buds, all throughout the stem started swelling up, making way for some fibrish thing from within, and that developed into new leaves and stems of my grapevine. 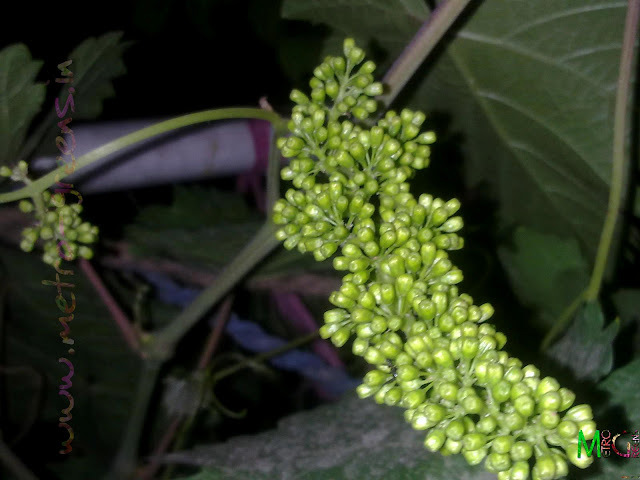 In another fifteen days, the plant started to develop some inflorescences, and now, I have somewhere around 12-15 such bunches in my grapevine. 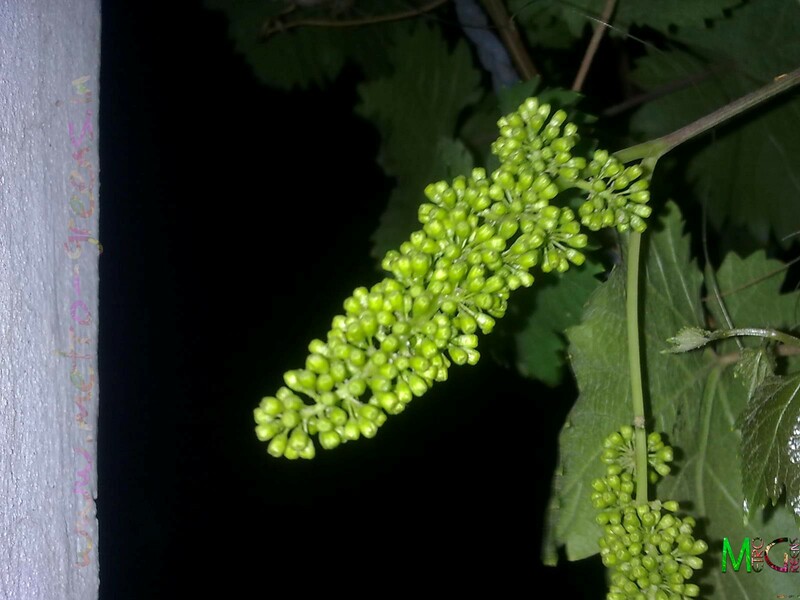 Although, its flowers are nothing much of a show, I'm eagerly waiting for the fruits, which, by now, have started taking shape, in the very first flower bunch, that bloomed about a week ago. Lets wait and see, what, I get. 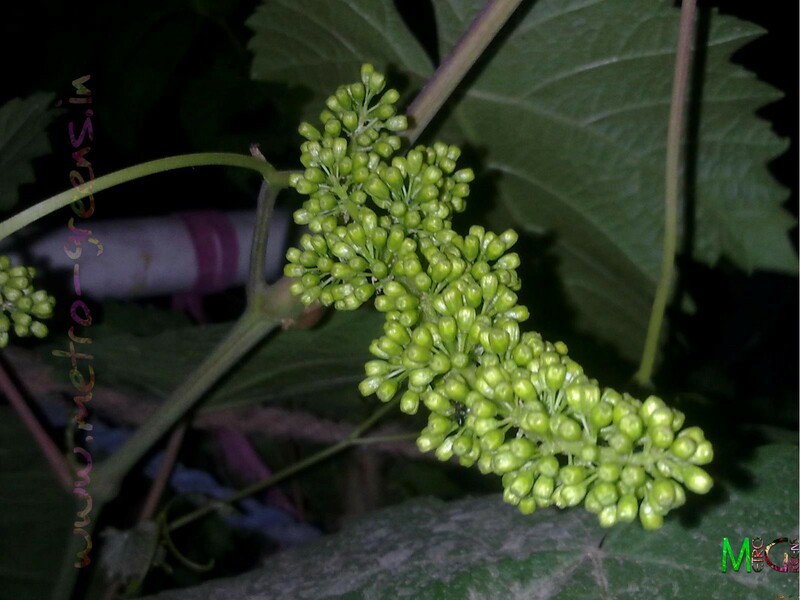 One of the inflorescences of my grapevine. Another inflorescence of my grapevine. The first one to bloom. 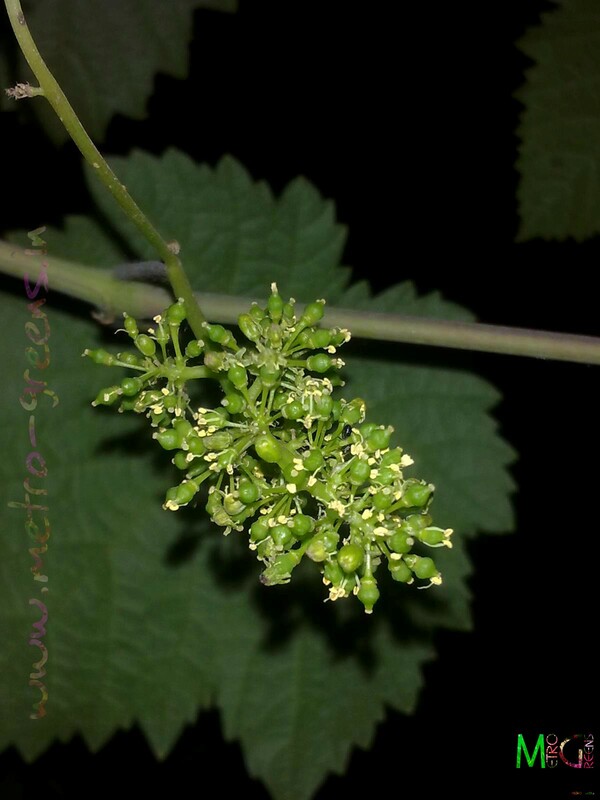 I hope you can see the tiny grape fruits, it's bearing. I'll keep you guys updated here, with the latest of the happenings in my garden, so, keep visiting and HAPPY GARDENING. Looks good! If the birds there are anything like the ones here, though, you might want some netting so they don't get your grapes first! Thanks for the comment, Jason. As of now, I haven't seen any birds, prying on my grapes. Though, I can see small ants moving on the plant. Also, thanks for the word of caution.